What a season for Los Angeles Kings center Jordan Nolan and his family. In the flash of Kings defenseman Alec Martinez’ double-overtime, series-winning goal that vanquished the New York Rangers in June, Nolan became a Stanley Cup winner for the second time in three seasons. Kings’ Jordan Nolan shared the Cup with his family and his tribe (Photo/Phil Pritchard, Hockey Hall of Fame). Earlier this season, his dad, Ted Nolan, returned from the hockey wilderness to become head coach of the Buffalo Sabres, the team that fired him after the 1996-97 season. And while most National Hockey League coaches not named Mike Babcock were at home during the 2014 Winter Olympics, Ted Nolan was busy in Sochi coaching Latvia’s national team. Babcock’s Canadian team took home the Gold Medal, but only after squeaking out a nervous 2-1 quarterfinals victory against Nolan’s Latvian squad. And who knows what might have been had Latvian goalie Kristers Gudlevskis not worn down under the barrage of 57 Canadian shots. 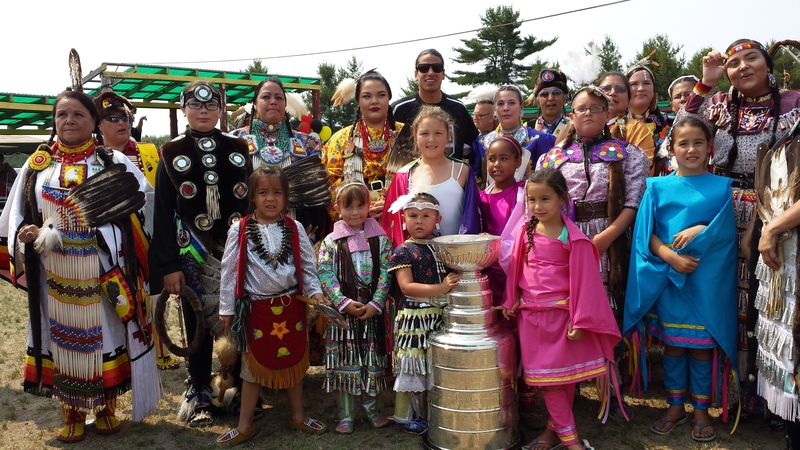 So Jordan Nolan’s day last week with the Stanley Cup was indeed a celebration – for the family and for the Garden River First Nation near Sault Ste. Marie, Ont. The Nolans are proud Ojibwe who say their heritage is as much a part of them as hockey is part of Canada’s national fabric. Jordan Nolan appeared in 64 regular season games for the Kings last season. He registered 6 goals, 4, assists and 54 penalty minutes. He played in three playoff games last season and was held scoreless. Hockey Hall of Fame’s Phil Pritchard, who travels with the Cup all summer as it goes to each member of the Kings’ roster and coaching staff for a day, was kind enough to share photos of Jordan Nolan’s day with Lord Stanley. Los Angeles Kings’ Jordan Nolan celebrates Stanley Cup victory at a Garden River Pow Wow (Photo/Phil Pritchard, Hockey Hall of Fame). Jordan Nolan brought the Cup to Garden River when the Kings won it in 2012, so he figured he had to up his game when he returned with Stanley last week. So he surprised father Ted by also brining the Jack Adams Trophy that he won in 1996-97 as coach of the year for his work with the Sabres. Father and son cling to the winner’s bling – Jordan Nolan (right) to the Stanley Cup, Ted Nolan (left) to the Jack Adams Trophy (Photo/Phil Pritchard, Hockey Hall of Fame). Jordan Nolan strikes a familiar pose with the Cup (Photo/Phil Pritchard, Hockey Hall of Fame). Ted and Jordan Nolan enjoy a little father/son quiet time with Stanley (Photo/Phil Pritchard, Hockey Hall of Fame).